To cook the beef, prepare and roughly chop the vegetables. Chop the bacon into smallish bits. Season the beef. Heat the fat in a casserole dish just large enough to hold the meat. Sear the beef on all sides and remove. Fry the bacon. Add the vegetables and sweat without browning. Add the red wine and reduce rapidly, scraping up any residues to deglaze the casserole dish. Put the beef back into the pot, cover with hot stock, add the herbs and peppercorns and bring to the boil. Turn down the heat so the stock is barely simmering. Cook for 4-6 hours. A knife should virtually fall through it when it is done. Let the meat cool in the stock and refrigerate overnight. Remove all fat that will have set on the surface. Lift out the meat, scrape off any jelly and slice into 1.5cm thick 'steaks'. Reheat the stock, discard the vegetables and strain the liquid through muslin. Measure 400ml of the stock and keep hot for the foie gras sauce. 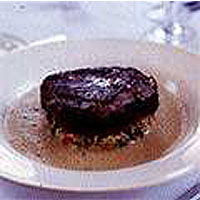 Heat the butter and oil in a non-stick frying pan and fry the steaks until brown and crisp on both sides. Rest in a warm place for 10 minutes. To make the foie gras sauce, bring the foie gras and butter to room temperature. Blend in a food processor, season, wrap in cling film and chill until required for final assembly. Peel and grate the potatoes. Sprinkle with salt and leave for 5 minutes. Wrap in a clean cloth and squeeze out the excess moisture. Divide into 6 portions. Heat the butter and oil in a 10cm frying pan, add a portion of potato, spread it evenly over the base of the pan and squash down gently to make a pancake. Fry briskly until golden brown. Turn and brown the other side. Repeat for all 6 portions. Keep warm on a rack or kitchen paper to prevent them going soggy. To make the creamed cabbage, heat the oil and butter in a large pan and add the garlic, onion, red pepper and bacon. Cover and fry gently until soft. Add the cabbage and cook gently, covered, until the cabbage begins to soften. Meanwhile, warm the cream, then pour over the cabbage. Bubble gently until the cabbage is cooked through. Season and fold in the parsley and spinach. Keep warm. To serve, place a portion of cabbage onto the centre of a large plate, using a 10cm ring to shape it neatly. Place one of the potato pancakes on top, and then finally the meat. Make sure you have turned the meat over to keep in the jelly that will have melted in the centre. Repeat with all 6 portions. To make the sauce, add the chilled butter and foie gras to the reserved hot stock, season with nutmeg and whiz with a stick blender. Skim off the 'cappuccino' froth with a small ladle and drizzle around the plates. Whizz again as necessary. This recipe was first published in Thu Apr 01 01:00:00 BST 1999.